It's only a few days late, but my room is as ready as it's going to be! It took a TON of work to move it cross country, repurchase and remake so much stuff! But I'm loving the way it is all coming together. Enjoy...and get ready for picture overload, and I was armed with my good camera this time! I saw this idea on Pinterest...sort of, and made it my own. Each student has two sticks (one yellow and one blue). My kids are allowed to only have two books out of my classroom library at a time. So when they take a book they put the stick in it's place. This lets me quickly see who is reading, and what they are reading (my library is set up by genre, author, and series). I don't have labels yet, the ones I used before are too big. My group tins made it with me, but of course they had a small make over, new ribbon to match the new color theme! 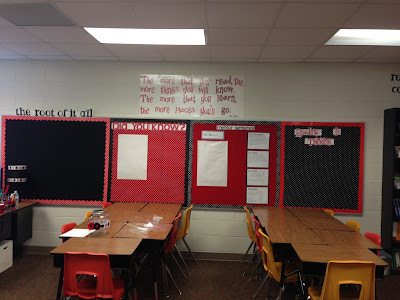 My new homework boards, again loved using them in previous years...just had to change the color theme. An overall view of the front of my room. 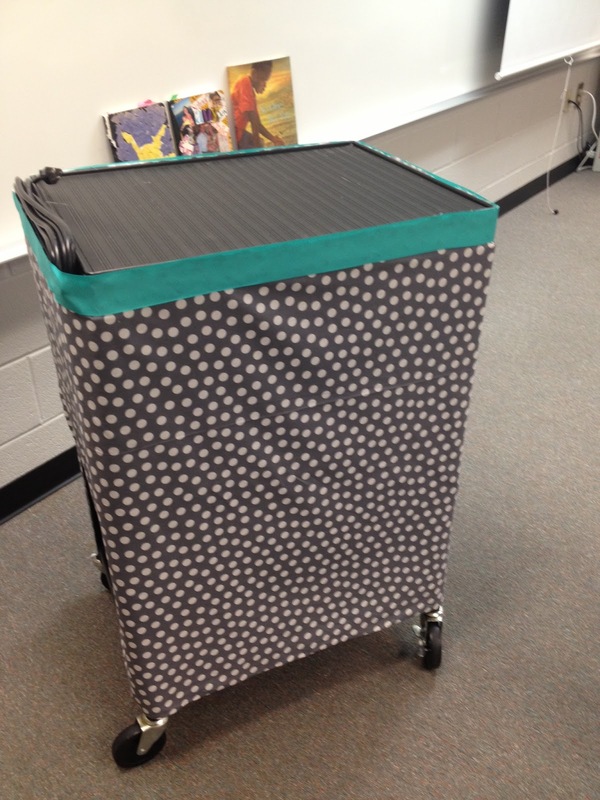 My overhead projector cart had a makeover and now holds my laptop and speakers (no speakers in the ceiling here). The big white arm is my document camera, I'm adjusting to the largeness of it! I am also transitioning from Mimio interactive board system to SMART. The huge white cart with wheels is my class set of iPods, yep each kiddo gets an iPod for the year. Updated my candy holding mason jars, and added a new procedure to my room, mystery walker (read about it here). I am still going to be using Mentor Sentences in my room, so here is my new "board". At this school we have to post Learning Targets (what the students will learn during and by the end of the lesson). I'm adjusting my thinking away from Essential Questions. The blue pages are laminated so I can wipe them off at the end of each day. 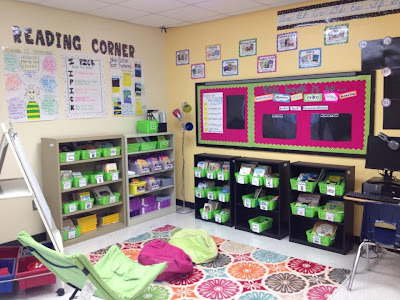 The teacher nook! I actually have my lesson plans done for next week (it helps that it's a short week). My new work completion/collection station. Again another Pinterest find! (can you tell I spent a lot of time on Pinterest this summer???) You can find the link here! The clothes pins are spray painted to match the subject sign. I used Sharpie to write the numbers on them. The "turn in buckets" I found at the $1 spot at Target! My job "boards" (again cookie sheets). I didn't want to spray paint these because one of my colors is grey. I got the job names from, you guessed it Pinterest! I made the actual job cards and name "plates". As you can see from the close up the color name plates (nameless right now due to making sure I see/meet my students first) they fit right under the job title and description, and I put magnets on the back. 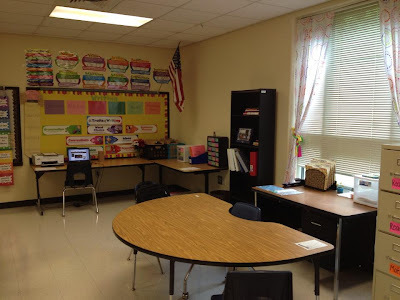 My math center central. This is set up very similar to my old one. My board is a little bigger and I shrunk my Witzzle Pro board. Sorry didn't get a close up of those. I am also doing a number of the week. These two items will be part of one of the centers. To post what tub contains which lessons/games etc. I simply bought the clear picture frames that have a built in stand, put color paper in the frame, and hot glued a bow on it! A Did You Know board. I'm going to put an interesting fact on it a week, and HOPE to write the fact then tape a QR code on the board that they can scan and it will link them to websites and such that would give them more info on the fact (this will be one of my reading center items). My reading center central..again very similar to last year's set up. Writing center central...this is a little blah right now, but will be better soon!!! My "famous" Walmart shelving! I'm loving the fabric backing on all my shelves this year. This is not exactly how they will look this year, but just for now. I'm waiting on my book boxes to get in, which will take up room. This year on the bottom right I have a little file/magazine tub. 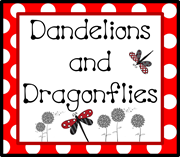 I have put a file folder in if, one for each kid in the group. This is where they will store worksheets they are still working on, instead of shoving them in their desks. The front two groups are set up with four across the back and two facing each other. I am now at 24 students, for some reason the 5th grade this year has lost students this summer...my number kept dropping. There is just two of us teaching 5th this year! My two back row groups had to be made a little different, to save room. My room is a little "squaty". I have no real back wall to use, and have groups come off of, and the furniture (storage) isn't movable so my arrangements are limited (this was set up number three I attempted this week!). So there you have it...my NEW Oregon classroom! I can't wait to meet my kiddos on Tuesday for Registration/Orientation. This past Friday I attended my new school district's New Teacher Orientation. It felt so strange after having taught for 11 yrs. and 9 of which were in the same county. I met a lot of people and look forward to seeing them around the district. Overall it was a review, and of course what would be a New Teacher Orientation without a little bit of Harry Wong; always a good read before the start of school. 5. Who is the teacher as a person? 6. How will I be graded? 7. Will the teacher treat me as a human being? So which one do you think is the most important? Did you answer these questions when your students started? On another note I have been working pretty hard in my room...and I think by Tuesday or so I should be able to have a reveal for you! 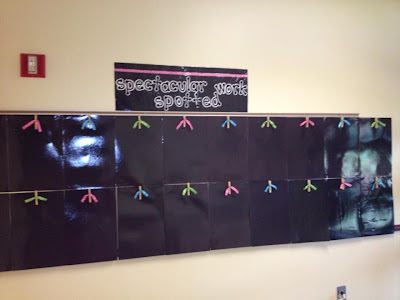 I've been doing the normal teacher decorating "stuff". Making signs and cutting out laminated items. 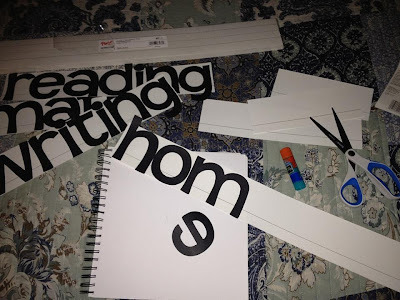 One shortcut I use in my room is gluing my lettering (that I cut on my Circuit cutting machine) to sentence strips, then laminating them. Makes cutting them out SO much easier, AND when I go to hang the signs/lettering up I don't have to worry about keeping the letters straight! Monday begins four days of teacher workdays for me! My plan was to have my room almost completed so that I could focus on lessons, curriculum, and all the little things that as a "new" teacher you have to learn prior to the first day! I think I have stuck to that plan. I even got my toes and hair "did"...so BRING IT! I am loving all the pictures my East coast friends are posting and sending me! So once again I thought I would share a room. 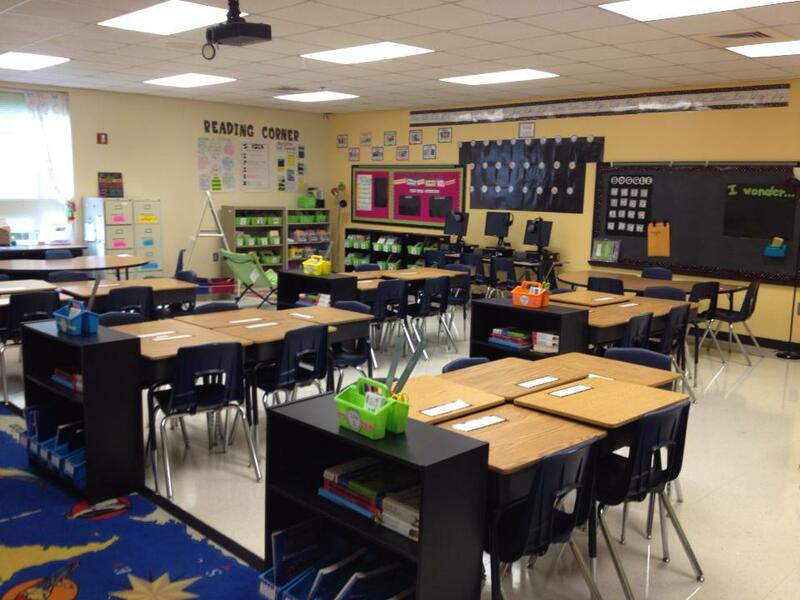 Who doesn't love looking at classrooms??? This teacher was actually a student teacher across the hall from me two years ago. 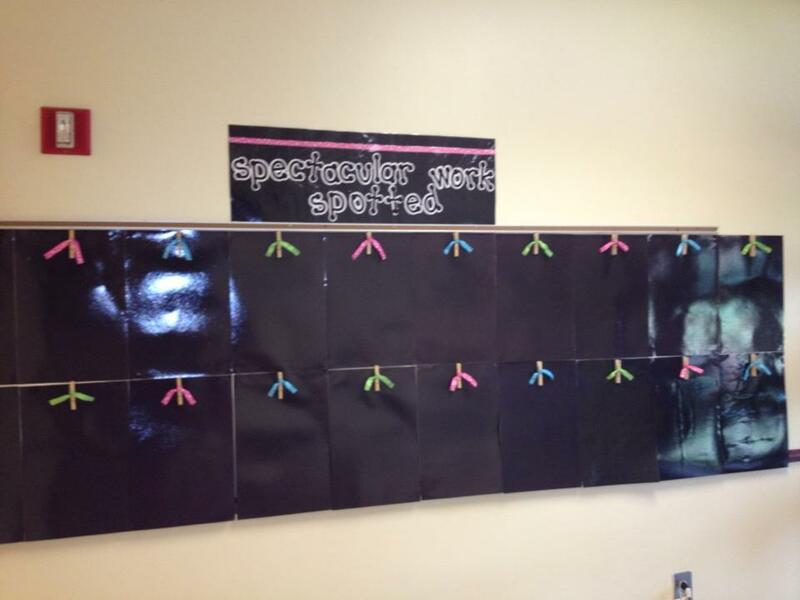 She did some long term subbing...and FINALLY this year is in her own room! I know she is going to do an amazing job. 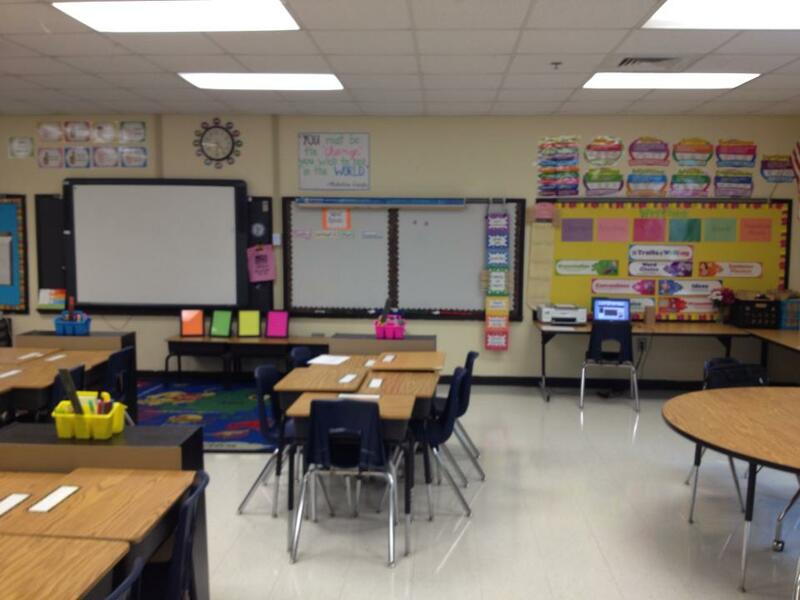 She is very lucky, and I think she will admit that her classroom is HUGE! Here is an overall view. Here is the view to the front of the room. Love the space on the floor near the board and interactive board. She decided to push her teacher desk to the wall and will probably use the kidney table for groups and as her desk. I love her reading corner with the bright pops of color! And she can use her easel in the reading corner for small groups. Her welcome signs at the door as you enter. Great saying! Well I am working on my room, piece by piece. It seems to be a slow process this time, but I can't wait to share it all with you soon (hopefully). 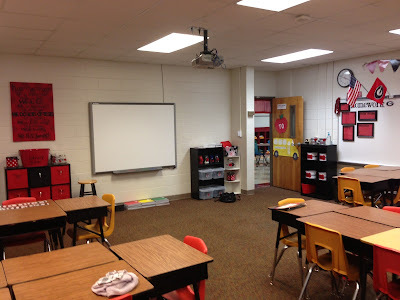 A Classroom R...wait, it looks very familiar!?!? 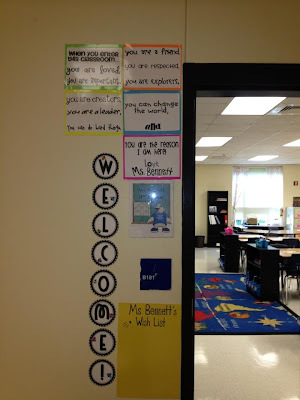 In honor of my east coast friends starting their first day of school tomorrow I thought I would share a classroom reveal with y'all. For those of you that haven't started yet hopefully it will give you some great ideas and a little inspiration. Don't be surprised if it looks a little familiar! This is one of my best friend's classroom. I left her back in GA, but she was also moving to a new school district! 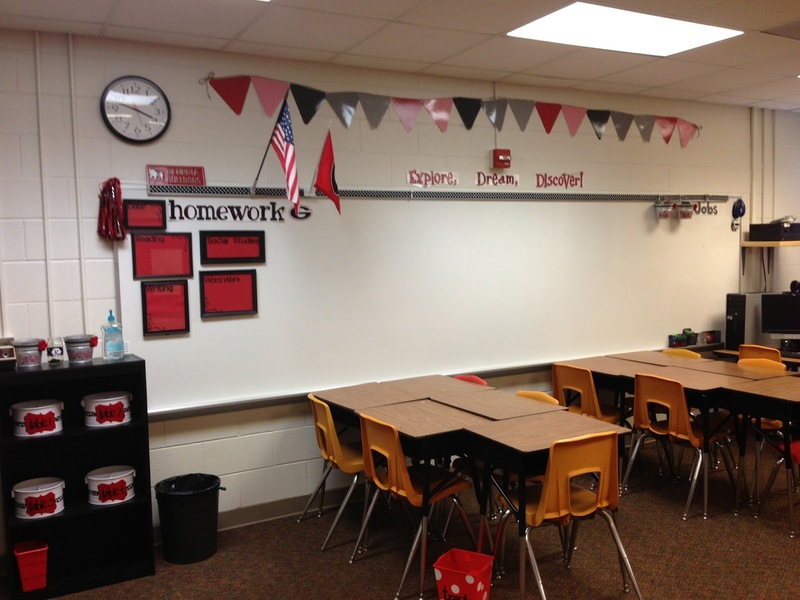 I'm really jealous of her SMART board being mounted on a wall instead of the white board. I'm REALLY going to miss having majority of my white board. But it also gave her an extra area to set up groups so that they were not in the center of the room, allowing room by the SMART board for the class to "meet her at the floor". 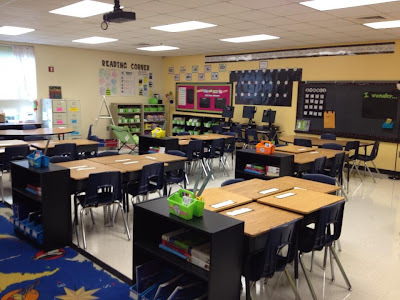 We both do it A LOT, even in 5th grade (they do groan a little, mostly because they know they aren't going to get away with anything when they have to sit on the floor!). I also LOVE that due to lack of space (something A LOT of you complain about, you always tell me...I wish I could do that but my room is so small!) she used her group caddies in a different way. Using the bookshelves I can't live without in other areas, sort of like stations, allowed her to utilize space and keep her groups the size they are! LOVE IT!!! 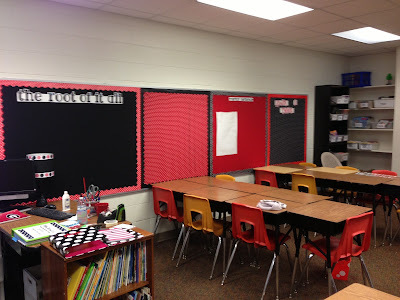 On the other wall are her bulletin boards...once again utilizing her space she has the desks/groups coming out of the boards allowing to leave the middle of the room open. My biggest secret to making my room look big is to push as much of the furniture up against the walls! Yes it does take away from being able to post things on your wall, but it allows for better flow, and the feeling of open spaces! Her boards are The Root of It All (the suffix, prefix, root word trees), Did You Know? (I'm using the same board and will post about that soon), Mentor Sentence, Reading Is Thinking (she is going to post some nonfiction information here). Here is another view of that side of the room. 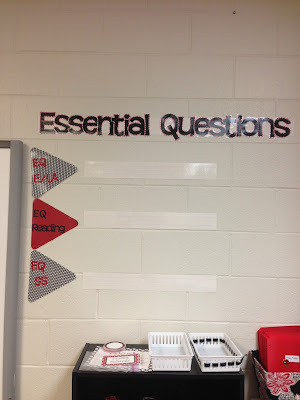 And finally her Essential Question Wall (she does team teach, this is why not all subject areas are posted). So you may recognize a few items in her room from my previous classroom reveals...yep, they were mine. I mentioned before that I had very very limited room when moving cross country. I really sat down and thought hard about what to take, what to sell, and what to leave. It wasn't easy!!! 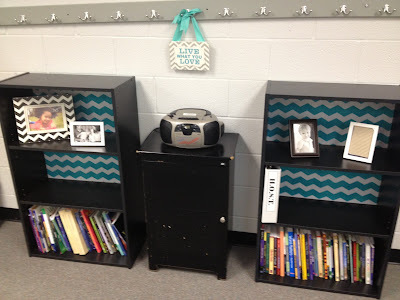 But when it came to time invested and money (yes my decor did cost $, but my classroom library cost more!) I took my binders (lessons, examples, etc. ), and my classroom library. I was thrilled to sell and give my stuff to my friend. She is a HUGE University of GA fan and is teaching really close to the university...so it just fit! She also completed the media (overhead) cart makeover! Love it!!!! I hope to share more of her classroom with you all soon! Now to wrap things up I have a little soap box to stand on...just for a second. You all know that I use a TON of ribbon. Not only in my classroom, but also in my business. I have NEVER run across this until tonight...and I was NOT A HAPPY PERSON!!! So I'm crafting, about to use some of this pretty much NEW spool of ribbon and come across this...notice anything? NOW you do!!!! I couldn't believe it. The nerve!!! I'm tempted to write a letter or something. That is a good few inches I can't use! And when it comes to a business or even just being a teacher EVERY inch counts! Has this ever happened to anyone else? Now back to my east coast friends...GOOD LUCK on your first day of school!!! I miss you guys so much and it's harder than I thought to watch you start your school years without me! I'm really going to miss the day to day discussions, thought/lesson sharing...and support system! LOVE and MISS you guys!!!!! Head over to Quite A Pear and enter the 1,000 likes GIVEAWAY! Over $50 in prizes. 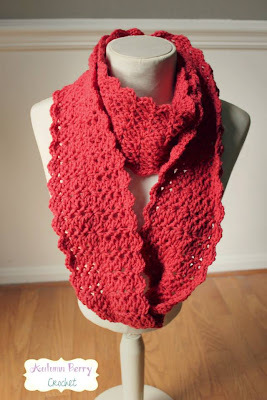 If you are bummed about not winning the label/ribbon set here is your second chance to win $25 worth of bucket/label/ribbon "stuff" ALONG with a Harper Infinity Scarf, from my other "pear". You can also enter here!